A person experiences vasoconstriction when they have constricted blood vessels. When vasoconstriction happens, blood flow is slowed or blocked. It is generally a warning of a health condition that requires serious attention. Vasoconstriction is an important process in the human body. It stops hemorrhage and retains heat. On a larger scale, it is a mechanism by which the body regulates and preserves arterial pressure. When constricted blood vessels occur, the skin will turn pale due to reduced blood flow and the body will become cool. If vasoconstriction continues for a long time, it can lead to serious side effects. Vasoconstriction can be mild or it can be severe. There are both physical and psychological conditions that can lead to vasoconstriction. It is also important to know that there are medications that can cause vasoconstriction, including cough and cold medicines. What can cause vasoconstriction or constricted blood vessels? Now that we have looked at what vasoconstriction is, let’s get right to the causes. The truth is that there are a lot of different factors that can contribute to vasoconstriction. Vasoconstriction and blood pressure are closely related. 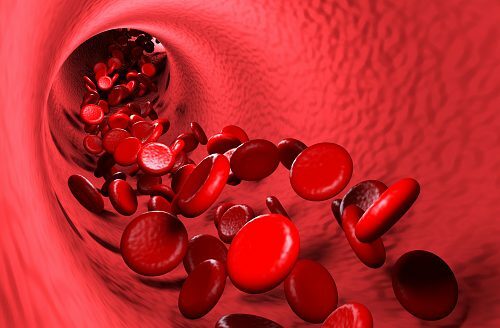 As blood vessels constrict, blood flow changes, which can lead to an increase in blood pressure. If the constricting goes on, it could result in chronic high blood pressure, which is a risk factor for heart attack and stroke. Here’s a look at some specific vasoconstriction causes, starting with diet. Caffeinated foods and drinks: Coffee, tea, soda, and chocolates can actually narrow blood vessels. While a little caffeine usually doesn’t harm a person, too much caffeine can lead to vasoconstriction. Salt: Sodium causes water retention and water retention increases the volume of blood in your system that has the potential to constrict vessels. People who eat a diet that is high in salt are prone to vasoconstriction. Avoiding processed foods is one way to cut down on sodium. Bad cholesterol: Foods that contain saturated and trans fat have a negative impact on blood circulation, so selecting foods with healthy cholesterol is best if you want to avoid vasoconstriction. Refined carbohydrates: Consumption of food that raises glucose levels can lead to vasoconstriction. White bread and white pasta are examples. Complex carbs, such as whole grains, vegetables, and fruit can help you avoid constricted blood vessels. Stress and anxiety: Research shows that stress can impact blood vessels. A sedentary lifestyle can also put people at a higher risk for vasoconstriction. The same goes for substance abuse, including street drugs. Below we look at medications and substances that can cause vasoconstriction. When we think about vasoconstriction, we have to consider RCVS as well. RCVS stands for reversible cerebral vasoconstriction syndrome. It is a group of disorders that include severe headaches and narrowing of the blood vessels in the brain. While RCVS can be reversed and many patients have been known to recover in a matter of a few months, the diagnosis is often missed. RCVS occurs when there is persistent vasoconstriction and as a result, blood flow and oxygen delivery is reduced to the affected area of the body. When constriction to blood vessels of the brain occurs, it is referred to as cerebral vasoconstriction. RCVS can lead to serious complications when it is not diagnosed and treated quickly. Stroke is one potential complication. What are the symptoms and risk factors of vasoconstriction? Vasoconstriction can sound frightening, especially to those who have never heard about it before and don’t know anyone who has ever experienced the signs and symptoms. Knowing what vasoconstriction symptoms are can help you decide whether or not you need medical attention. Depending on the severity of the vasoconstriction, slurred speech may also occur, but research suggests that it is rare. Mild vasoconstriction doesn’t pose a big threat, but moderate or severe vessel constriction can have risks, including hypertension, improper heartbeats, limb amputation, erectile dysfunction, and possibly a heart attack. Responding immediately to signs and symptoms of vasoconstriction will reduce chances of further illnesses. Vasoconstriction treatment varies from person-to-person; however, here we endeavor to explain the most common approaches. Medications: There are medications that act as vasodilators to increase blood flow. They work by blocking calcium channels and inhibiting the activity of alpha-adrenoceptors, which are a class of important G-protein receptors. Exercise: Cardio exercises for an hour each day can help combat vasoconstriction. Exercising can enhance blood flow and help dilate the blood vessels. Avoid cold: Being exposed to too much cold can constrict blood vessels so it is important to not stay in the cold for too long. Healthy diet: Maintain a healthy diet – one that does not include processed foods, canned foods, or items that contain too much salt. Limit alcohol and drugs: Avoid alcohol intake, as well as drugs like cocaine. Avoid stress: The less stress, the better. Avoiding stress can help prevent acute vasoconstriction. Treat underlying diseases: When constriction is due to another disease, it is crucial to get proper treatment for that disease, as it can only help with the vasoconstriction. Massage: Some people find that massaging the area can increase blood flow so that vasoconstriction is at least temporarily reversed. Some people report that just a 10-minute massage is all it takes. As with any condition, it is important to pay attention to your overall health too. If you are generally in good health, it will make fighting vasoconstriction easier. You should eat well-balanced meals, maintain a healthy weight, and get ample sleep. Vasodilation and vasoconstriction: What is the difference? It is easy to mix up terms like vasoconstriction and vasodilation. While both impact blood pressure, vasoconstriction, and vasodilation are two different mechanisms. Vasoconstriction refers to narrowing of blood vessels, but vasodilation refers to the widening of blood vessels. The main difference is that vasoconstriction increases the resistance and decreases blood flow and vasodilation decreases resistance and increases blood flow. Essentially, during vasoconstriction, smooth muscles of the blood vessel walls constrict by reducing the internal diameter of the vessel. Vasodilation relaxes the smooth muscles of the blood vessel walls, thus increasing the internal diameter of the vessel. Various massage techniques can be used to increase vasodilation. One sign of vasodilation is pinking of the skin. This shows increased blood flow to the area. Massages can promote the release of histamine and histamine acts as a neurotransmitter, increasing the permeability of blood vessels. When permeability increases, it leads to vasodilation. Blood pressure is a good barometer of health. It indicates how our respiratory rate, heart rate, oxygen saturation, and body temperature are functioning. Normal resting blood pressure for a healthy individual is 120/80 mmHg. If you have concerns about your blood pressure or are experiencing any of the signs and symptoms we have outlined, seek medical attention immediately.